Happiness Project #34: Messy Happy Hearts Sugar Cookies! Preheat your oven to 350F and line two baking sheets with parchment paper or Silpat Mats. In a stand mixture, cream the butter, sugar and eggs at medium speed for 2-3 minutes until light and fluffy. Add in each egg, one at a time, until well mixed. Sift in the flour, baking powder and salt, adding the heavy cream as needed, until throughly combined. This dough should be a stiff not soft texture. If it’s too soft to handle, cover and let chill in the fridge for 30 minutes to an hour. 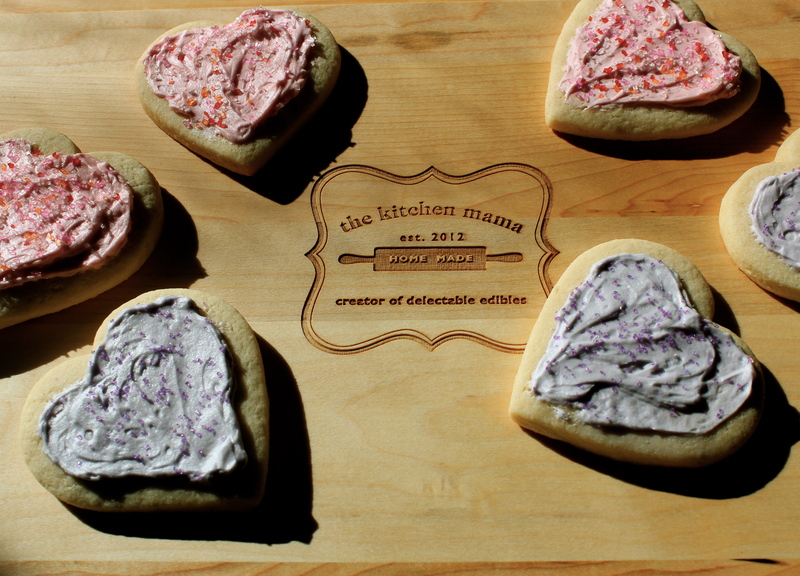 Break out that pastry board (marble is always preferred over wooden) and rolling pin. Quick tip, one of the most valuable things I learned while in Pastry School is that rolling pins are NOT all created equal. The most efficient rolling pin for cookie dough? The classic wooden pin with no handles. Bake for 8-10 minutes and let cool on a wire rack while you’re creating the buttercream frosting. In a stand mixture, beat the butter for 2-3 minutes until smooth and creamy. Drop the mixture speed down to a lower setting and sift in the powdered sugar until well incorporated with the creamed butter. Increase the mixer speed to a medium setting and add in the salt, vanilla extract and heavy whipping cream. Whip for 3-4 minutes until nicely thickened. And now, FROST, with or without your favorite colored dye!!! And SPRINKLE!!! Sprinkle away!!!! That’s the whole fun of creating sugar cookies, after all, right? Especially if your little ones are helping you! P.S. My Mom gifted me with a beautiful personalized cutting board (featured above) for my birthday this year! Jealous? Go to redenvelope.com for your own! « Happiness Project #33: Strawberry Cream Cheese Muffins!